So today, I was a different kind of doula. I was much more involved with the wet, cuddly newborn side of birth than I usually am as we welcomed baby goats on our farm. We are relatively new to farming, but I was struck by how many similarities there are in birth among mammals. These mamas craved safety and peace as all mothers in labor do. One of the mamas appreciated my quiet presence, reaching out to nuzzle me — and then after the babies were born, she gently butted me and told me to get out. 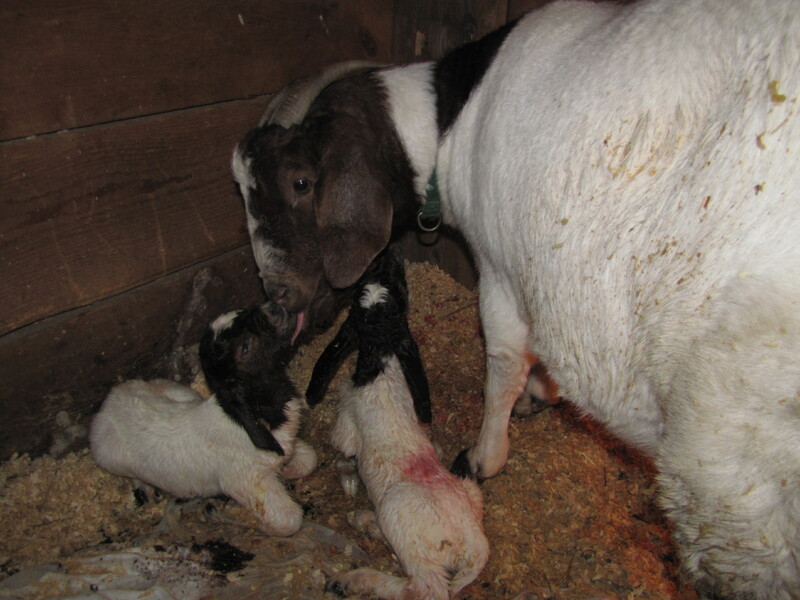 Each mama “counted fingers and toes” on her baby, licking them dry from head to toe. They also encouraged their babies to nurse when they were ready, patiently giving them time to transition from womb to world. And, like I often see with human babies, they were ready to nurse at about the one hour mark after birth. Goats have a special vocalization that they only make to their new babies. Amazing how wondrous birth is! I am blessed to have seen birth in its completely natural state (well, except five quiet family members watching) and will ponder the lessons from today to see how I can bring that to my human doula work too. I asked mom, but she wasn’t sure. How did you manage to get both lady goats to deliver at the same time? Is gestation that precise with goats? Gestation is normally 150 days +/- 2 days. I think they tend to synch cycles, and the fertility window for each cycle is relatively short, so they probably started the pregnancies at close to the same time. As far as labor starting so closely together, I think that may be a combination of a very low pressure weather system and pheromones/oxytocin in the air from the first to start.